Graduation season isn't for another couple of months, but this YBF Family already won. We chatted with the party of three who went viral this week on social media. Find out inside how they're showcasing black excellence in the most fabulous way. We're not the only ones who got the feels about her family simply after viewing the Facebook post of Shenitria "Nitra" Myles. At least 27,000 others did too. 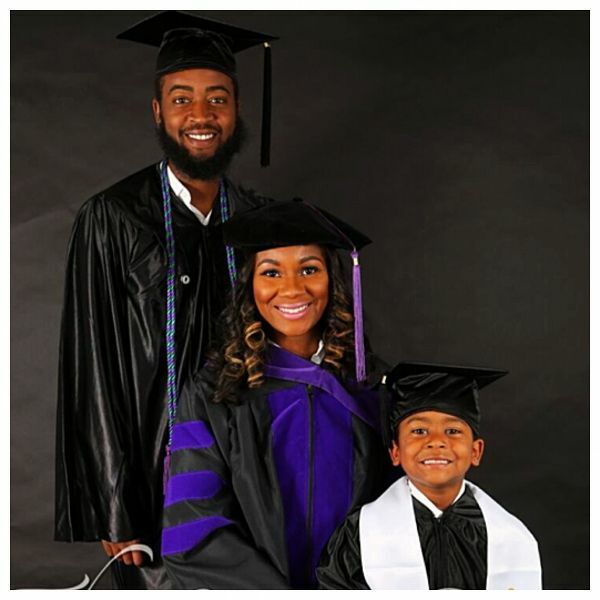 A few days ago, Fort Wayne, Indiana native Nitra posted a pic on her Facebook page showcasing herself, her husband, and their son in their graduation caps and gowns. But it's the caption that made almost 30,000 people share the picture and scream a collective "Yesssssss, y'all did that!" Nita and Atlanta-native Mario met each other while in undergrad at Xavier University in New Orleans and got married in 2010. While they will both cop their post-graduate degrees this coming May, their son MJ will follow in their footsteps by picking up his diploma at his kindergarten graduation a few days later. The road to their black excellence, however, hasn't been an easy one. "I became pregnant with our son my sophomore year in college," Nitra exclusively tells TheYBF.com. "It was a trying time because we attended Xavier in New Orleans and had no family within the area, the closest was 7 hours away. My husband and I began to depend on one another for daily aspects in life as we both finished undergrad." Getting pregnant and having a baby in college, while away from their families, didn't stop the couple from pursuing their degrees. They went harder, and it paid off. Every day was a new learning experience and everyday we pushed one another so that we could still achieve the goals we had set," Nitra tells us. 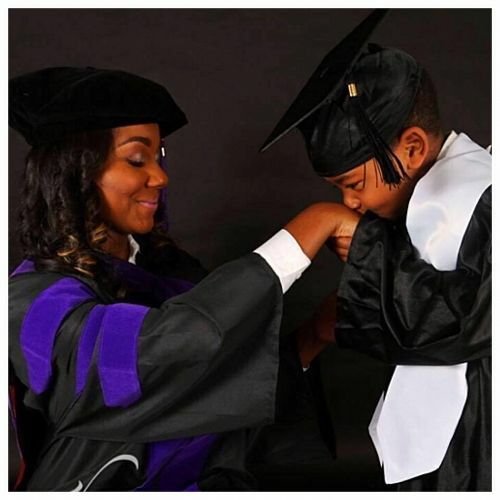 The proud Loyola New Orleans School of Law student, mommy and wife wants the world to know, "This year we will both be graduating from graduate school and our son will be graduating from kindergarten with honors. God is so good." But that's not all. Nitra just published her first book last Thursday, which doesn't surprise us at all about the super go-getter. Balancing Adversity, which is now available on Amazon, is a 29-page digital book that the soon-to-be lawyer (in less than two months) tells us isn't your traditionally organized book. Instead, it's "inspirational reading that will have specific headings that you can turn to at different stages of your life." She says the book, where her husband serves as Editor, is not in perfect order because life isn't in perfect order. Agreed! The cover: The family graduation pic atop. Congratulations to this astute and amazing real-life YBF Family!